A dozen members of the Student Labor Action Movement assembled outside Massachusetts Hall on Friday afternoon to deliver a letter to University President Drew G. Faust, imploring Harvard to cut ties with Teach For America if it does not make several key changes to its program by Oct. 8. The effort is part of a larger national movement started by United Students Against Sweatshops that criticizes Teach For America, a nation-wide program that recruits college graduates to teach in low-income communities for at least two years, for undermining the quality of public education. Chanting "education not privatization," Gabriel H. Bayard '15 and Hannah L. McShea '18 protest Teach For America on Friday, Sept. 26 outside Massachusetts Hall. “We’re calling on Harvard to support and provide the resources for people who want want to have lifelong careers in public education, not people who want to teach for a couple of years and then go to law school or business school,” said Blake A. McGhghy ’17, a SLAM member who spearheaded the Harvard branch of the campaign. The letter to Faust addresses three areas in which students hope to see reforms to Teach For America: demanding the organization only send students to areas in which there is a teaching shortage, providing corps members more education and training, and cutting ties with corporations the students think threaten teachers unions such as Exxon Mobil and JPMorgan Chase. If the changes are not made, the letter asks that Faust sever ties with the organization, including breaking partnerships such as the Principal Leadership Pipeline through the Graduate School of Education, deferrals and scholarships to Harvard’s graduate schools for TFA alumni, and the recruitment of undergraduates. Harvard has a long relationship with Teach For America—the organization recruits heavily on-campus and receives support from many faculty members and students, according to Teach For America recruiter Tess Nicholson who was on hand for the assembly. Twenty-nine College graduates joined the corps last year, she added. Nicholson, a Boston College alumna who just finished teaching as a corps member in East Harlem, New York, watched the event from the side. Nicholson said she saw promotions about the event on social media and decided to attend to reach out to SLAM members in hopes of finding common ground. Nicholson said that despite the outcry from Harvard students and other national activists, Teach For America stands by its mission to ensure excellent education for all children. In a letter responding to the activists of the national movement, Teach For America co-CEO Matthew Kramer defended the organization, pointing out that nearly 90 percent of TFA’s 37,000 alumni work in education or in low-income communities. Nicholson said she is confident the organization will continue to be successful in recruiting Harvard students who value education. SLAM plans to more aggressively urge the University to cut ties with Teach For America if the organization fails to undergo the reforms SLAM members and other advocates across the country deem crucial. “We don’t say there should be no TFA, we say that major reforms are necessary,” SLAM member Hannah L. McShea ’18 said. At the rally on Friday, SLAM members waved signs reading “Cut Ties with TFA!” and chanted “education justice.” A few passersby offered members of the group high fives, but few joined in. —Staff writer Mariel A. Klein can be reached at mariel.klein@thecrimson.com. Follow her on Twitter @mariel_klein. Teach For America co-CEO Matthew Kramer ’98 defended his organization on Wednesday, arguing that accusations by Harvard student protesters that TFA’s teachers are unprepared and its corporate backing is unjust are misguided. Kramer’s remarks came in response to a Student Labor Action Movement protest on Sept. 26 in which a dozen group members delivered a letter to University President Drew G. Faust imploring Harvard to cut ties with TFA, a nation-wide program that recruits college graduates to teach in low-income communities, if it did not enact certain changes by Oct. 8. That effort is part of a larger national movement started by United Students Against Sweatshops criticizing TFA for allegedly undermining the quality of public education. Student activists are demanding the program make three changes: only send teachers to areas in which there is a teaching shortage, provide corps members more education and training, and cut ties with corporations the students deem socially unjust, like Exxon Mobil and JP Morgan Chase. 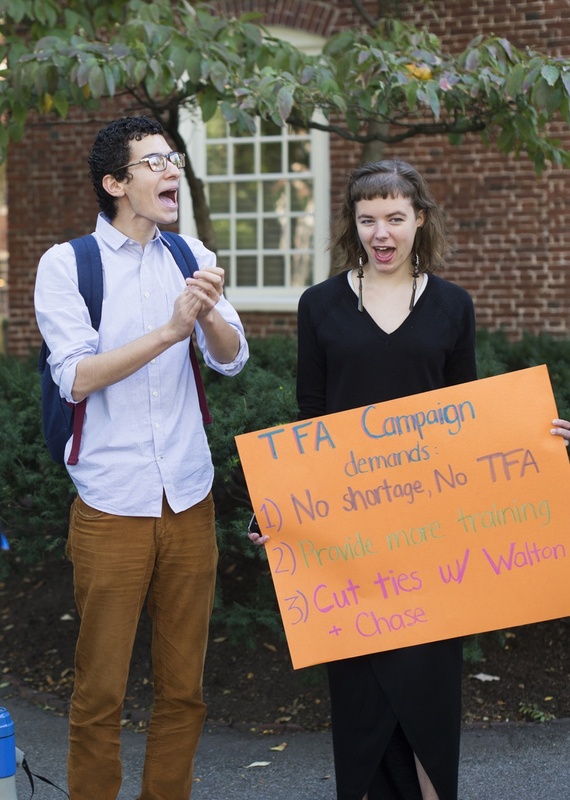 In a phone interview on Wednesday afternoon, Kramer responded to these concerns, saying it was “disappointing” that Harvard students were calling for the University to cut ties with TFA. Specifically, Kramer argued that though TFA teachers only receive five weeks of intensive training before they enter the classroom, the organization invests in extensive supportive coaching during the two years corps members serve. Kramer also cited efforts TFA is making to increase teacher preparedness, such as a pilot program that allows college juniors who have been accepted into the program early to take educational classes in their senior year. Addressing concerns about corporate support, Kramer said that TFA relies on corporate donations only in order to strengthen programs. Though Harvard has appeared to take no action to address SLAM’s demands, SLAM pledges to amp up its campaign. On Wednesday, SLAM and USAS members wrote a letter back to Kramer, as well as TFA’s co-CEO Elisa Villanueva Beard and founder Wendy Kopp, standing by its accusations and requesting a national meeting with TFA leadership within the next month. The letter makes the claim that there is no longer a national teaching shortage, which TFA was originally created to fill, and implored TFA to stop sending corps members to communities that do not have teaching shortages. The letter also alleges that TFA inflated statistics about how many of its alumni work in education or low-income communities when their service is up. Kramer, for his part, argues that talent shortages continue to exist in every low-income neighborhood in America and that TFA only sends teachers where they are requested. SLAM also plans to hold a “Teach For America Truth Tour” event on Friday featuring a panel of TFA and Harvard alumni to discuss the future of the program and American education. Last year, 29 graduates of the College joined TFA, according to TFA recruiter Tess Nicholson.